Earlier this year, Homeland star Claire Danes said that season eight would be the end of the series. Not long afterward, there was some talk that the Showtime TV show could continue without Danes. Today, the cable channel confirmed that season eight is indeed the end of Homeland and the final 12 episodes will begin airing in June 2019. Our Emmy and Golden Globe winning hit drama HOMELAND will be back for an eighth and final season, premiering in June 2019! 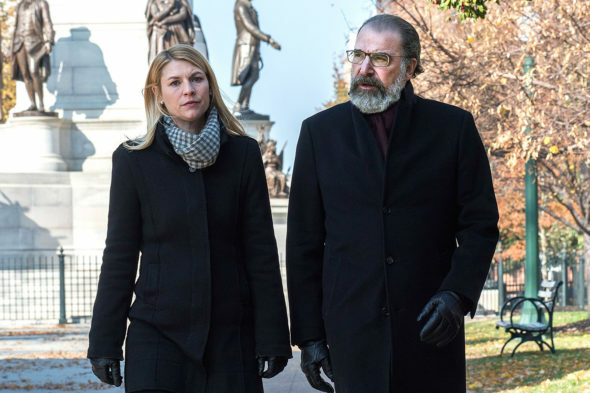 Starring Emmy, Screen Actors Guild and Golden Globe winner Claire Danes and Emmy and Tony winner Mandy Patinkin, production on the final 12 episodes will begin in early 2019 in a still to be determined location. The network’s No. 1 drama series, HOMELAND originally premiered in the fall of 2011 and quickly became one of the most acclaimed dramas on television. With its opening episodes airing just weeks after the 10th anniversary of the 9/11 attacks, HOMELAND became a meditation on the human costs of the “war on terror.” Following its first season, HOMELAND was honored with six Emmy wins, including Outstanding Drama Series, Outstanding Writing for a Drama Series and Outstanding Lead Actress and Actor in a Drama Series. Additionally, the series was awarded Golden Globe, Peabody, Television Critics Association, AFI and Critics’ Choice Awards. Over the next six seasons, the show would go on to be an audience and awards juggernaut. What do you think? Do you like the Homeland TV show? Are you sorry that there won’t be a ninth season? More about: Homeland, Homeland: canceled or renewed?, Homeland: ratings, Showtime TV shows: canceled or renewed? The best series I have ever seen; I was so hooked up. Brilliant, smart and fast pace. Don’t let this end. I love that show. I’m going to miss Clare Danes and Mandy P.
Excellent show and great actors—-but, while I might be disappointed that it is ending, those great actors might just want to move on to something else ! I would hope that the final season would be one that the writers & actors will make memorable.